Mark your calendars! We are thrilled to announce that the 2020 Pi Gamma Mu Triennial International Convention will be held in Washington DC. Convention events will begin on Thursday, November 12, 2020 and will continue through Saturday, November 14, 2020. Events will include student paper presentations, a student Leadership Development Program (registration required), chapter and student poster presentations, a keynote address, a welcome reception, an awards ceremony, roundtable and panel discussions, student elections, and more! A block of rooms has been reserved at the Embassy Suites by Hilton Crystal City-National Airport in Arlington, VA. 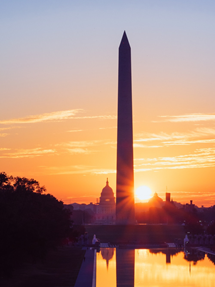 The hotel is situated just 1 mile from Ronald Reagan Washington National Airport, 3 blocks from the Pentagon City Metro Station, and 4 miles from historic sites of Downtown Washington DC. Complimentary shuttle service is provided between the Airport and the hotel. The hotel provides a complimentary cooked-to-order breakfast, a complimentary evening reception with drinks and light snacks, a fitness center, an indoor pool and whirlpool, and a business center. On Friday, we will take the Metro to downtown DC to enjoy convention activities in some very historic and beautiful locations. The convention committee is hard at work developing a spectacular program.